This is a guest post by Karina Dupree. Karina is a writer, designer, traveler, and tech enthusiast and considers herself a Jane-of-all-Trades for everything creative. She writes about all her adventures at The Flying Cashew. Currently residing in Texas, she spends most of her free time writing, playing video games, and hanging out with family and friends. Follow her on Twitter @theflyingcashew. Money, sadly, is a big deal. And as you get older, the money thing tends to get trickier, especially if you’re in a serious relationship where money seems to become an unavoidable topic. I’ve heard all kinds of stories concerning money and couples. The biggest one is that it tends to be the top reason for broken marriages. Why does it become such a huge issue and spoil what is such a beautiful and even blissful thing? As a part-time designer and writer with a full-time job, I didn’t need money to take away any more moments from my puppy and my fiance. Simple would be the only type of financial system that would work for me, so that it wouldn’t scare me away from actually going through with it. Here’s my suggestion for a first step toward approaching bills as a young couple. A whiteboard along with weekly “meetings” with your significant other can be a great foundation for a healthy financial relationship. You’ve done all the other work of getting to know each other, with your quirks and habits, but money can become a deal-breaker even in the most committed relationships. Our overall whiteboard setup is above. It includes our mail outbox, calendar, non-monthly expenses, and the almighty whiteboard. We’re in the middle of paying for our bills this month, which is why the amounts are in different colors, paid vs. unpaid. Here’s why I believe the whiteboard system works. 1. It lays everything out in the open. A key to a successful relationship is communication. A whiteboard serves as a tool to illustrate what is coming in and out of your household. You should have a section for income, and another larger, detailed section for expenses. You can and probably should also list your income, especially when you first get started! To help figure out the “not every month” expenses, a tool that I used in the beginning, before we officially “combined” our income, was the personal monthly budget Google form. That will give you a clearer view of what expenses you might come across. A good template to list those out for quick reference that I’ve personally been using is this one. With all this in front of us, it’s very obvious what money we have coming in and going out. 2. It’s a tangible starting point for couples trying focus on their finances. Depending on personality and your own personal situations, your budget and discussions about money may get more complex later in your relationship. 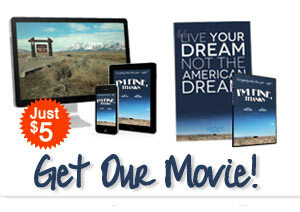 But you need a good solid starting point for making your shared finances a priority. Quick, simple and visual. That’s what we’re going for. 3. It leaves room for quick revisions and open discussion. Whiteboards are cheap, they’re fun to write on, and they save paper, therefore saving trees (doesn’t it give you that nice, happy do-gooder feeling?). A good idea before even talking about budgets is writing out your expectations from each other. Say one of you expects to save every single penny you have for a huge joint purchase, but the other would like some spending money to go out with friends. This would be a chance to find middle ground to keep both people happy; that means you’re more likely to reach your financial goals. Here you can see our “negotiated points” on the right side of the whiteboard. I wanted to get my hair done, and we both agreed to try and eat out less. These are the things to discuss, and they’re easy to change as you go! 4. It’s a visual reminder of what’s due and how your budget is shaping up for the month. When both my fiance and I began thinking about pooling our money together, I was honestly freaking out. I came across Dave Ramsey’s book at a night job I had. I will say, I haven’t tried any of his other products, but it got me thinking about how to view monthly budgets. Budgets change every month. So expect have a fresh start the first of every month, where you “reset” your whiteboard. And be sure you’re keeping up with it as you go! And don’t forget to check those non-monthly expenses we talked about above, so you can reflect those appropriately too. 5. Keeping it updated gives you a good reason to check in with each other weekly. Remember, you’re in this together. I’m serious about this one. You can’t read each other’s minds, so don’t even try. Hold a weekly check-in meeting to update the board and make sure that you’re both taking the steps you agreed on to meet your goals and express any concerns you’re having. Doing this could prevent serious problems in the long run. This method has worked well within my household, but it may or may not work for you. The important thing is that you find something that works for YOU. No matter how long you and your significant other have been together, what have you done to ease the transition into a more financially committed relationship? 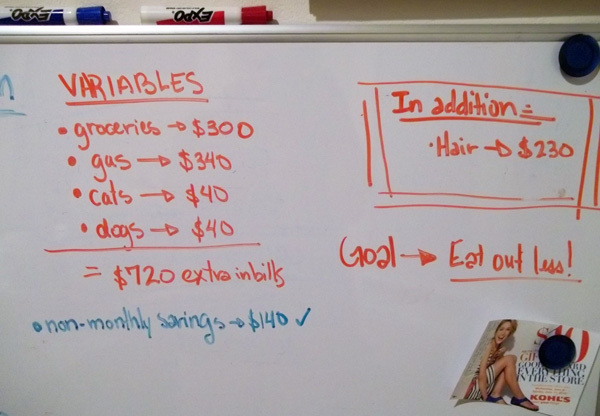 My husband and I hold weekly budget meetings and use Google Docs to share a monthly budget spreadsheet, but I like the idea of the white board much better for a couple of reasons. 1) It only takes a second to update. 2) It’s always visible, keeping budget reality in your face as you make daily decisions. 3) It will allow my daughters to see what the family budget looks like and give them a living example they can rely on as they go out into the world. Thanks for sharing! Its never too early to teach kids about money. I don’t have kids of my own but I know that when I got started paying bills I wish I had a better idea if how to handle my money. It took a while to get it right. Fantastic idea but 26 years too late for me…..lack of honesty killed my marriage. I’ll do better next time – thanks for the tips! Great idea! This goes in the “keeper” file! Dang, glad I’m a guy! 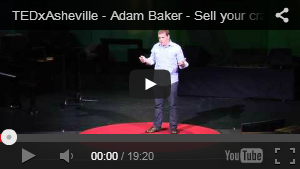 My heart broke open when I saw this – I think this is going to help us immensely! I am so grateful for this post. My husband and I have good money communication, but this is a great idea that allows both parties easy access to the monthly financial situation without having to check in with the other. One suggestion I would like to make is that “Eat out less” is not a real goal. Make the goals more specific. If you are looking to cut back on eating out, a better goal would be “Eat out once per week.” That way you know whether you are achieving the goal or not. Right now we are trying to work out what triggers our eating out. Later on that day, i began making a chart and using the monthly calendar. We end up talking about in towards the end of the day. Next month will be more of a strategy and divving up cooking responsibilities. Thanks for the comment! We do something similar…only wth pen and paper. We make a budget on the first of the month. Then I pay bills and allocate savings according to the budget that we created. Then we both stick to it pretty well. Sometimes we go slightly off the plan but usually we don’t! I think honesty and communication are the keys here. 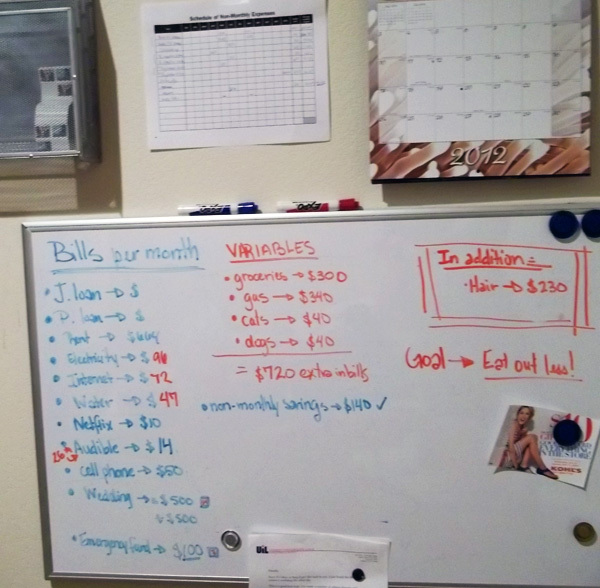 We dont do the whiteboard but we have a binder where the monthly budget and bills paid is listed. We can open it up at any time and see exactly where we are. I love the idea of the white board — specifically so that the kids can see what’s going where in our budget. Unfortunately, that wouldn’t work for us because the only place to logically hang it would be in a public area. It’s not that I’m ashamed of our low income (I’m quite open about it, actually! ), but we have some family members who would be tempted to turn it into an excuse to jump into our business, instead of just enjoying our company & ignoring the “wall art” with all the charts & numbers. My hubz & I do, however, have a similar method which we keep on my laptop. Once a week we go out on a budget “date” to McDonald’s, have an ice cream cone, & go over our budget via their free wi-fi. All of our bills are kept organized in a binder, each in it’s own separate plastic document protector, so we just flip through & see what’s what. Takes all of 15 minutes, we have some much-needed “alone time” away from the kids, it’s an inexpensive venue, & everything is on the up-n-up. Going out makes the act extremely intentional, lending to a feeling of being proactive. So even when there is no money in savings, or we’re behind on a bill due to inability to pay, we still come back home with a sense of relief, because we’ve been responsible & done all we can for the moment. Now… increasing our income… that’s a different comment for a different post… but budgeting? We got this. Thats awesome! The key thing is for openness and working together as a team and not against each other. Good post! I like the weekly meeting and white board idea. LOVED this post! I’m gonna do this! This is awesome! THANK YOU FOR THIS POST!!!!! This is Awesome! 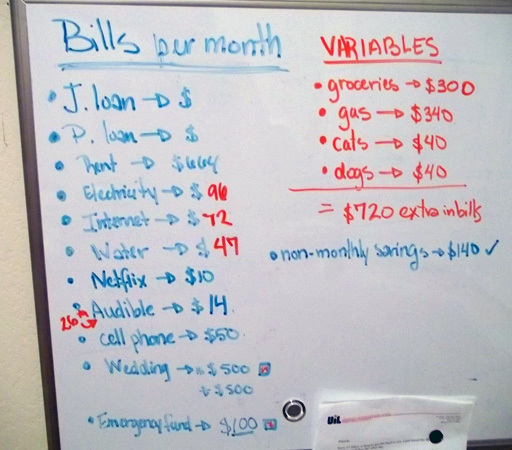 with a capital A.
Wow, I love the idea of using a whiteboard with my finances. I already create a monthly budget, spreadsheet it, and track the heck out of it. But this just seems darn fun if you ask me. Very cool :). My wife and I did whiteboard money management for quite a while when we were married and paid off 30k in debt this way. It really is a great system. Put the board somewhere you will see it multiple times per day and you subconsciously start focussing more on meeting your goals. Just checked out your site and I love it. Thanks for what you’re doing. I will be back. The whiteboard idea really helped with saving up for the wedding. I have a month and a half before the big day and we’ve been able to save and pay for most of the wedding stuff in cash. I keep a smaller whiteboard for detailed wedding things/to-dos since I have family that have offered to contribute. Thanks so much for sharing this. 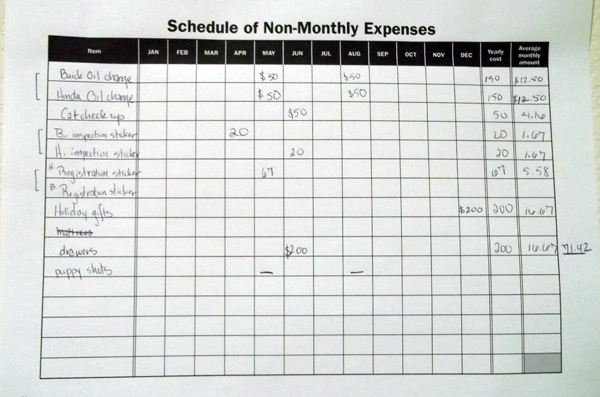 It did not even occur to me to plan out the non-monthly expenses! We’re so careful about the monthly bills, and now I think my man and I will be able to get on top of it all. You can’t plan everything in black and white, but it’s possible to at least try. I don’t understand the $300 “Groceries” variable?? Can you explain that a bit more? This is more personal than anything. As we were keeping track of our expenses, we noticed that groceries seemed to fluctuate the most out of all of our bills. We are currently in job transitions and in between moves. This affects how much we end up paying for groceries and therfore becomes a variable. Eventually, i would like this to go along with the other bills but i dont see that happening until we finally move in october / november. My wife and I have multiple bank accounts. 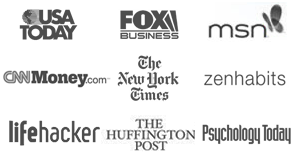 We have our own accounts, shared accounts, retirement accounts, business accounts etc etc. In order to track everything, we use mint. Its free and gives a updates as frequently as we like. Its not perfect, but helps track expenses into categories very nicely. It also has a budget tracker to let us know when we may be pushing up against one of our budgets. I also like the net worth and monthly spending analysis. The best part, its free. I used mint for a while and quicken but for the sake of simplicity and time, we started using the whiteboard. (I loved mint btw). We try to make the task less tedious as possible and since my fiance and i are currently in our first steps of combing our income, our concern is providing a good foundation for communication. Great idea! I keep a running IOU balance with my parents for things that seems to work fairly well. What was bought, when, what for and the cost. I’ve recently become addicted to writing things out on a whiteboard. Everything from work projects to bill due dates is all out near the door where I will see it at least 3-4 times a day. This way I can occasionally stop and erase things I’ve done, add new things I learned about that day. Planning out how much money you’re spending is a great idea I’ll start to take advantage of ASAP. It’s always so good for me to read about new methods to communicate about money with my other half! I ask my hubs to write down what he spends and then let him know how we did at the end of the month. If either of us wants to spend more than $50 on something, we have to consult with the other one first! Totally going to do this when I get married! I like this idea a lot. We just bought a house and really want to get our budget planned out so it will be easy to follow. I think the white board would help us teach our kids and also meet our goals of debt freedom. We are almost there just a few more payments on our car. We also use a budget map check register to help plan for future expenses. You might check it out. I would love to hear your thoughts on it. I always wondered how to handle the money:separate accounts, one combined acct, or both? Do you each get equal spending money or a percentage of income? I keep track of all monthly expenses, set up a budget for groceries, even make a grocery list and still at the end of the month far too much money has been spent than I would have liked! We actually have a big white board at home, might get used for something that just pretending to be working from home. This is brilliant for all of us visual learners out there! My husband and I do our bills via excel spreadsheet, I like being able to have our bill-paying history available. That’s the one downside I see to the whiteboard idea, it gets erased each month. But I LOVE the openness of it and I would even put it somewhere guests could see it as well (we don’t have children). I think you would get less peer pressure from friends about going out to eat and going out in general if they understood where you are financially and what your goals are. They may even have some helpful suggestions! Good luck eating out less (I hate to cook so I have trouble with this one too). Usually we just take care of this through an excel spreadsheet, but I think seeing what you’re working towards in a more creative fashion, (like a dry-erase board), would allow us to feel more accomplished at the end of the day. I’ll have to run it by wifey first, but I’m sure she’ll love it. Great article. I used the whiteboard spreadsheet, than an excel spreadsheet and finally decided to build my own tool to track personal spending. Thanks for the tips!